In 1958, Edward Teller, father of the H-bomb, unveiled his plan to detonate six nuclear bombs off the Alaskan coast to create a new harbor. However, the plan was blocked by a handful of Eskimos and biologists who succeeded in preventing massive nuclear devastation potentially far greater than that of the Chernobyl blast. 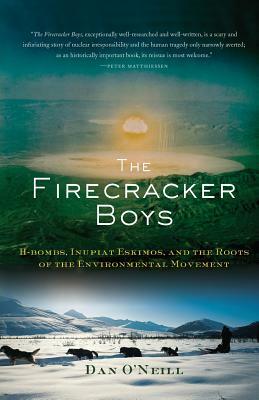 The Firecracker Boys is a story of the U.S. government's arrogance and deception, and the brave people who fought against it-launching America's environmental movement. As one of Alaska's most prominent authors, Dan O'Neill brings to these pages his love of Alaska's landscape, his skill as a nature and science writer, and his determination to expose one of the most shocking chapters of the Nuclear Age. Dan O'Neill is the author of A Land Gone Lonesomeand The Last Giant of Beringia. He was named Alaska Historian of the Year by the Alaska Historical Society for The Firecracker Boys. He lives in Fairbanks, Alaska.